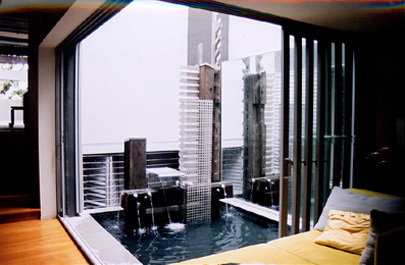 From the top floor of this suburban home/office you can see a view of the city as well as this sculpture location. This, together with the strong vertical and horizontal elements of this site provided the conceptual seed for this sculpture. Named after a 50's teledrama, 'Naked City' is a microcosm of the lines, planes, play of light and humanity that is a city. 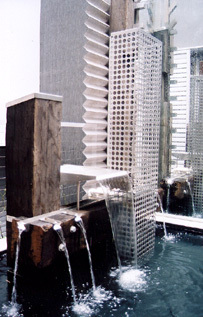 Water falls from several elements of the sculpture, bringing its life, light and sound into the work space.